I’ve spent some time over the past 2 years putting together a listing of all the TV weathercasters we’ve seen in this market over the years. About a year ago I showed you my work so far. But just this evening I’ve added a few names, updated a couple of folks that are no longer doing TV weather, and cleaned it up a little in general. 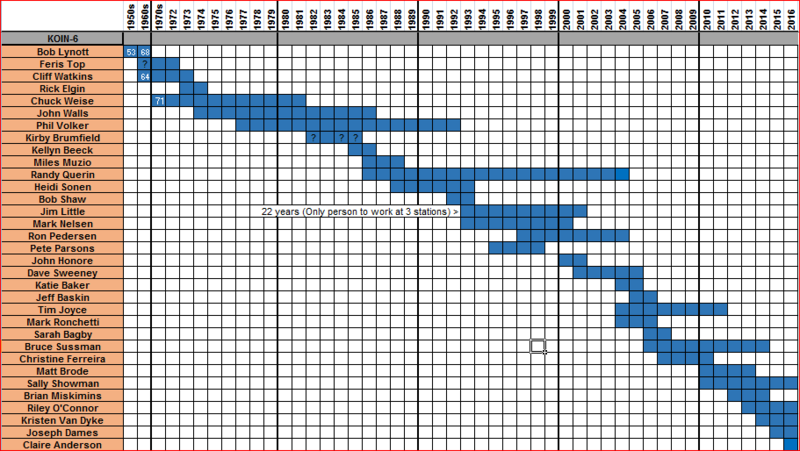 I’ve added the length of the Portland TV career for those that made it to 20 years. It takes some real stamina, flexibility and likability to make it 20 years in any television weather forecasting job. Jack Capell was the undisputed king, lasting 44 years at KGW! Jim Little was the only one (that I’m aware of) of the “20+ year club” to make it to 3 different stations. Another 3 years and you’ll join him Rod! I’ve only included those that have/had some sort of regular weather shift, not free-lancers or occasional fill-ins. There must be another 50 of those spread out over the years. No insult intended if you are one of those folks. The pre-1980 years get a bit more sketchy, probably quite a few missing names there. Please let me know if you are aware of any errors in these charts. Either via email or in the comments. You are currently browsing the FOX 12 Weather Blog blog archives for the day Sunday, August 28th, 2016.